The #1 Albums: Santana's "Abraxas"
My first radio was a green plastic box with a giant dial and tubes inside. I didn’t care that it got only AM—it got WLS, the Top 40 giant from Chicago, and that was enough. It was the fall of 1970, the most important season of this geek’s life. Some of the hit songs that fall seemed almost dreamlike then. Santana’s “Black Magic Woman” was one—a mysterious organ line materialized as if out of the dark before a couple sticks of percussion ushered in a guitar line that scissored through the AM-radio ether and straight into your brain. I’d been weaned on the sort of radio that played polka music and had obituaries on the local news. This stuff was much, much cooler. Today, that guitar sound is unmistakably Carlos Santana’s; 42 years ago it was just another brand-new sound in a world that was full of them. 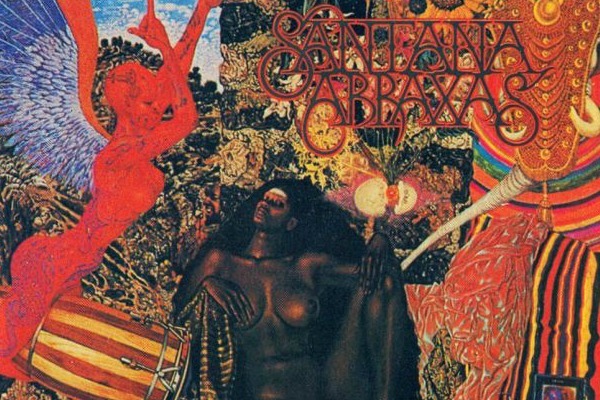 Santana came out of the San Francisco melting pot of the 60s, got famous after a fiery performance at Woodstock in 1969, and landed with Abraxas in 1970. The album incorporates several different styles: “Black Magic Woman” was a cover of the Fleetwood Mac original, recorded when the Mac was a serious blues outfit; the second single, “Oye Como Va,” is a Tito Puente salsa number. Jazz, rock, instrumentals, songs in Spanish: Allmusic.com says that in modern times, “an album as eclectic as Abraxas would be considered a marketing exec’s worst nightmare.” But as the 70s began, its small-d democracy made it a broad-based hit. Santana would be intensely prolific throughout the 70s and the first half of the 80s, but Carlos Santana’s greatest moment of popularity had to wait until the 1999 release Supernatural and its sweep of the Grammys. “Good for him,” some of us thought as we watched that night, even as we dreamed of the way we first heard him, on a hazy AM-radio wave from a hundred miles—and 30 years—away. Abraxas hit #1 on the Billboard album chart on October 24, 1970, but for only a week. A month later, it returned to the top spot for five weeks, through the end of the year. It bracketed the run of an album by a band that has appeared in this feature before, and which would end up one of the top album acts of the 70s with seven #1s in all. Here’s one of the straight-ahead rockers on the album, “Hope You’re Feeling Better,” written and sung by Gregg Rolie, later of Journey.